Wells 10 miles, Bath 14 miles, London (Paddington) from 85 minutes (from Bath Spa). Bristol 22 miles, Frome 6 miles, Babington House 3 miles. A great family house with bags of living space in an exclusive development of just 7 exceptional properties in an idyllic rural location close to several country villages. The centres of Wells, Frome, Bristol and Bath are all in easy travelling distance. The properties are exceptional by virtue of the quality of their construction and design resulting in stunning accommodation which must be viewed to be fully appreciated. 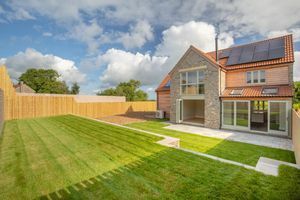 This handsome house has stone and larch clad elevations under a tiled roof and has generous, comfortable, easily managed and eco friendly accommodation. 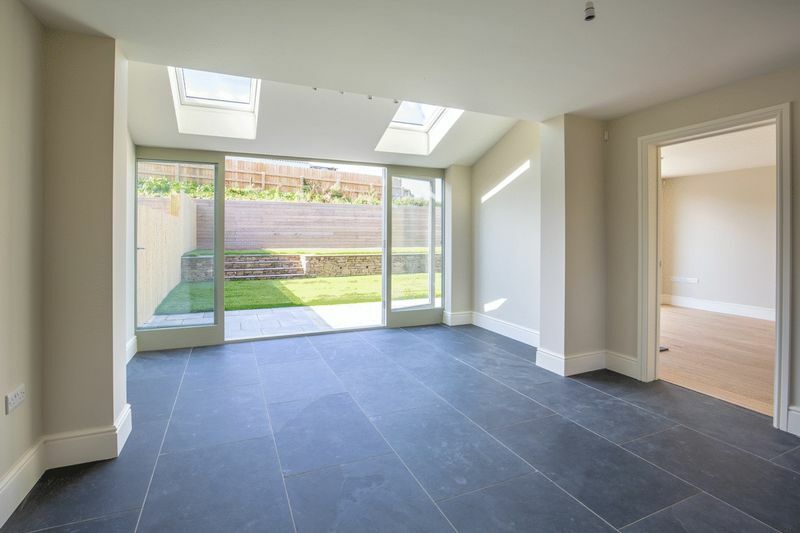 This includes a reception hall, cloakroom and a sitting room with bifolding doors opening to a landscaped garden. 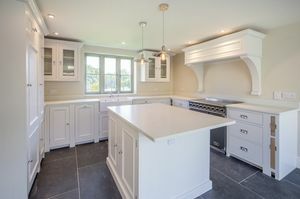 In addition it has a wonderful open plan 25 ft. kitchen and dining room with french doors to the garden. 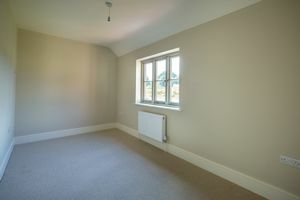 The house also includes a utility room, integral garage, 4 luxurious bedrooms and 2 bathrooms. The property has underfloor central heating with a Mitsubishi Ecodan air source heat pump, and solar panels. These are eco friendly and will result in low running costs. Outside is space for a further five cars / plentiful parking, paved terraces and a landscaped garden. 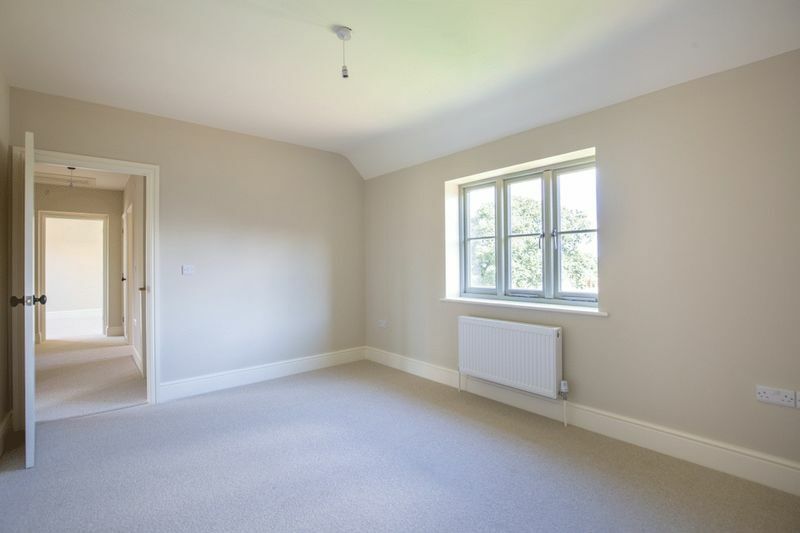 Hornbeam Lane is in a quiet peaceful setting in the beautiful Mendip Hills well away from any busy road. 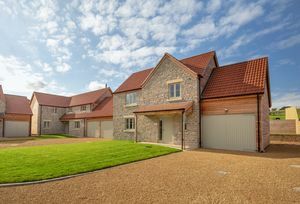 It's approached from a quiet country lane and on entering the small private lane the quality of design and construction is evident together with the individuality of the properties. 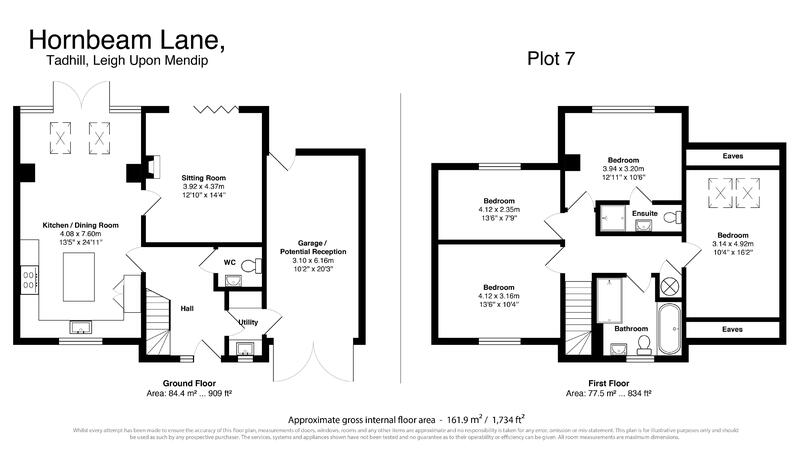 The 6 houses and 1 bungalow stand in their own gardens and vary in size from 2 to 5 bedrooms . 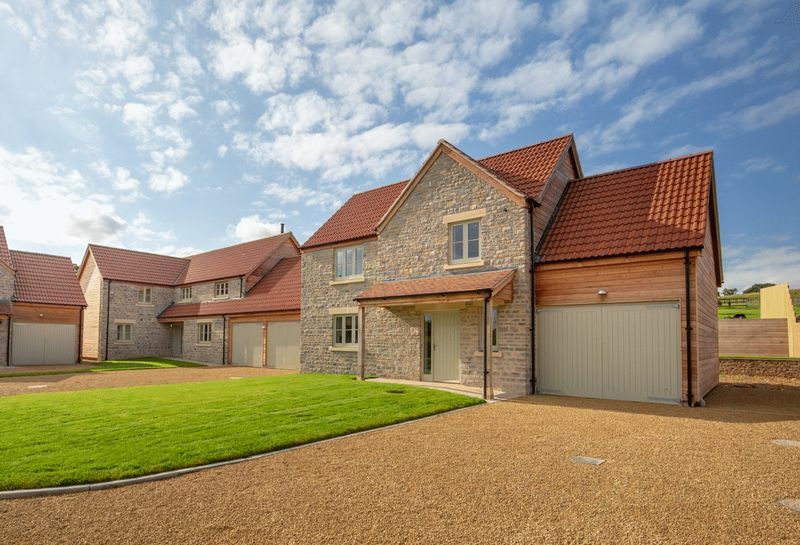 The best quality materials have been used in the construction with gently coloured Purbeck stone and sand shaded Doulting stone both enhanced by larch wood cladding, oak timberwork and tiled roofs. The properties are stylish and luxurious with good quality finishes and appointments. 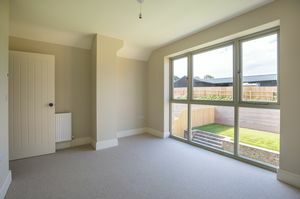 Also green credentials are high with pv panels, air source heat pumps and hardwood double glazed windows and doors. 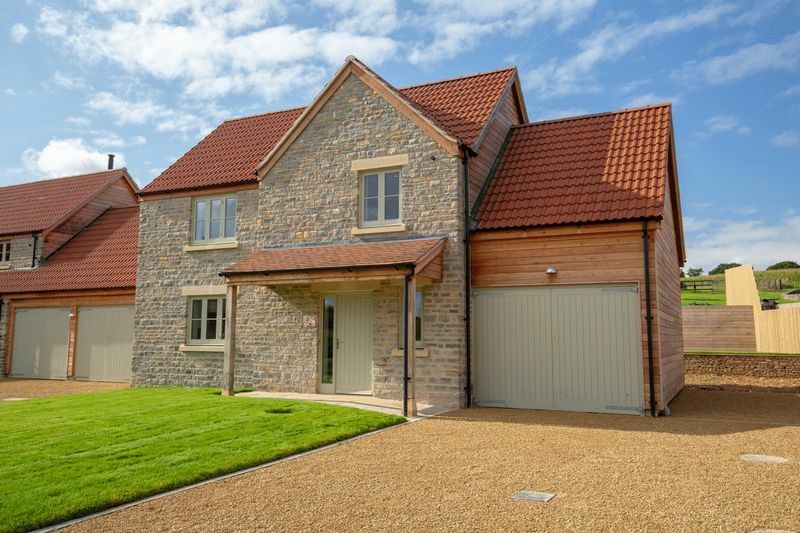 Outside the gardens are landscaped with well laid lawns and Cotswold gravelled drives. A really excellent house in a commanding position facing across its garden and drive onto Hornbeam Lane. It has a splendid location, bags of living space with great style and comfort which must be viewed to be fully appreciated. The front door opens into the hall which has engineered oak flooring, a carpeted staircase and a cloakroom with a hand basin and wc. 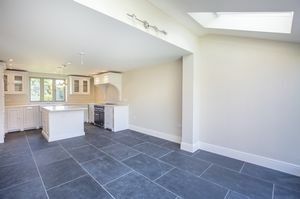 The most striking room in the house is the 25 ft. kitchen open plan kitchen/dining/living room which is simply a brilliant room at the heart of the house and designed for modern living. 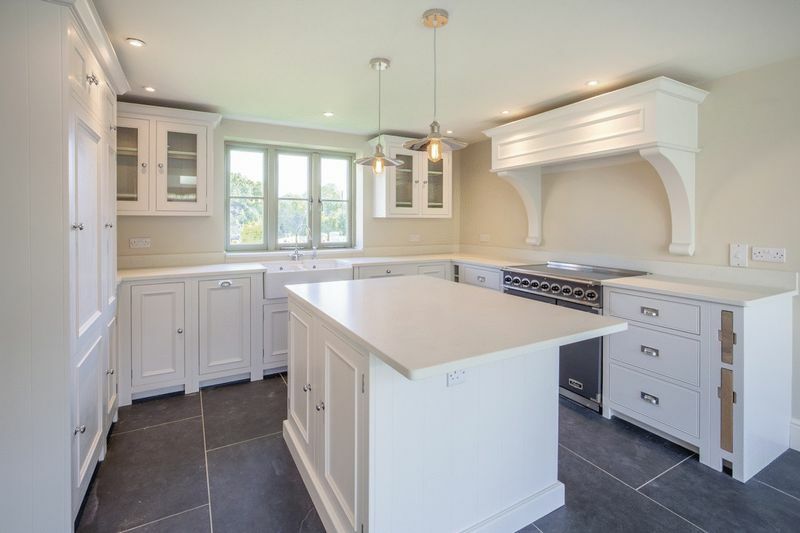 It has a slate floor and double french doors (flanked by full height windows) into the garden. There's room for a dining table and also sofas for a living area. At the other end of the room is the kitchen area. 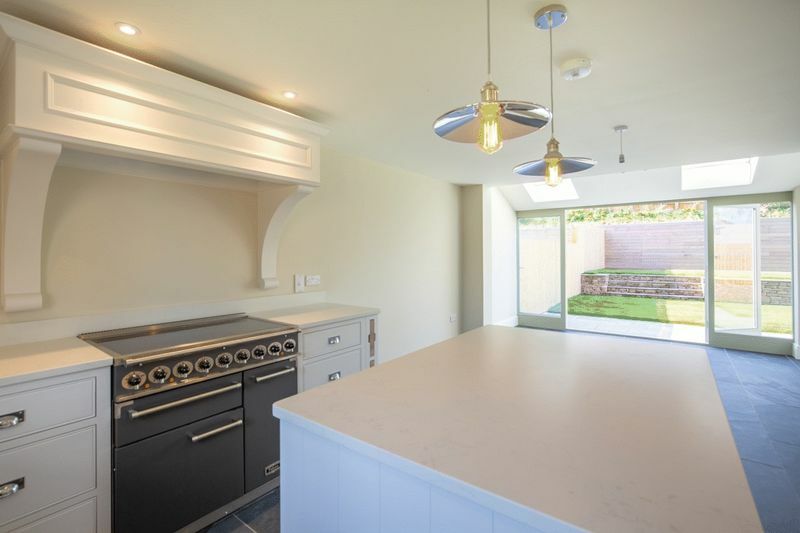 This has excellent "Neptune" units (lifetime guarantee) including cupboard and drawer units, a central island (with power sockets and breakfast bar), Quartz Carrara work surfaces, a two bowl sink, pull out integral larder and a recycling bin. Integrated appliances include a Falcon range cooker with an extractor hood above, dishwasher fridge and freezer. 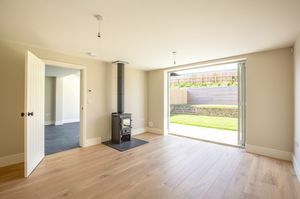 A door from this room opens into a large sitting room with an engineered oak floor, a Clearview wood burning stove on a slate hearth and bi-folding doors out to the terrace. The large windows in these two splendid living rooms flood the house with light and add to its very special atmosphere and character. There's a utility room off the hall, again "Neptune" fitted with sink unit, cupboards and shelves and a door through into the integral garage. Upstairs are 4 good size double bedrooms and 2 bathrooms and the landing has an airing cupboard containing the hot water cylinder. 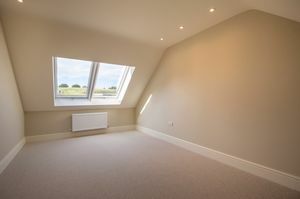 The master bedroom again is very light and airy with full height windows and good views. 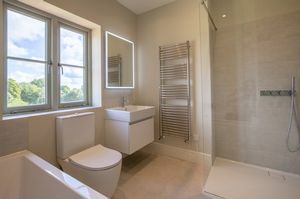 It also has an en suite shower room with a large walk in shower area, hand basin, wc and heated towel rail. 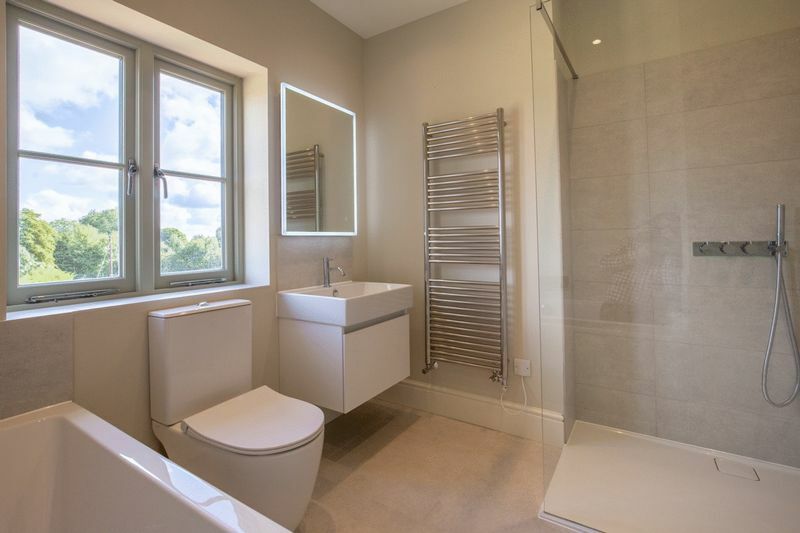 There are 3 further double bedrooms and a family bathroom with a tiled floor, hand basin, bath, wc and a walk in tiled shower area with a drench shower and a hand attachment. In front of the house is a neat lawned garden alongside a wide Cotswold stone gravel drive providing plenty of parking space. The garden is to be delineated with a privet hedge. At the rear of the house is a sunny west facing garden and a paved sandstone terrace approached directly from the sitting room and the living room area of the kitchen. This leads onto a well laid lawn bounded by a stone wall with steps to a further slightly raised lawned area. The gardens are ideal for family use and entertaining and have great scope for greenfingered owners. Leigh on Mendip is a small village which was part of the manor of Mells and was held by Glastonbury Abbey from Saxon times until the dissolution of the monasteries. It then passed to the Horner family of nursery rhyme fame. Located on the Mendip Hills it's within a few miles of various other small villages which together provide a range of amenities. It lies between the cities of Wells, Bath and Bristol and the increasingly popular town of Frome. These all combine to offer a wide range of commercial, cultural and sporting facilities and of course all the benefits of this beautiful rural area are immediately to hand with many footpaths and bridleways. There are excellent state and independent schools including a number of local primary schools, Writhlington, Norton Hill, All Hallows, Downside, Wells Cathedral, Millfield and the Bruton and Bath schools. The much renowned Babington House is a short drive away, as are the Vobster Inn Restaurant, The Pig and the Roth Bar at Hauser and Wirth in Bruton. 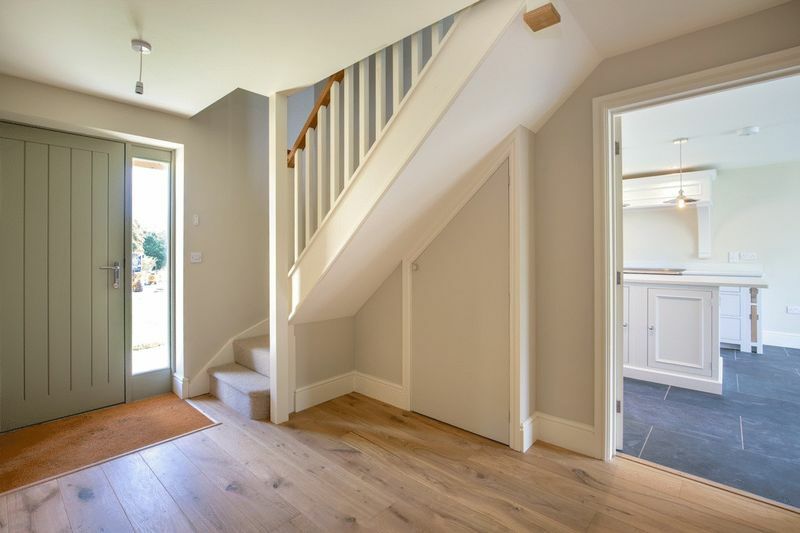 The house is very well placed for the commuter with rail links at Westbury (for London Waterloo), Bath Spa and Bristol (for London Paddington). Other stations include Frome, Trowbridge and Castle Cary. Bristol International Airport is also within commuter distance providing an ever expanding network of services. 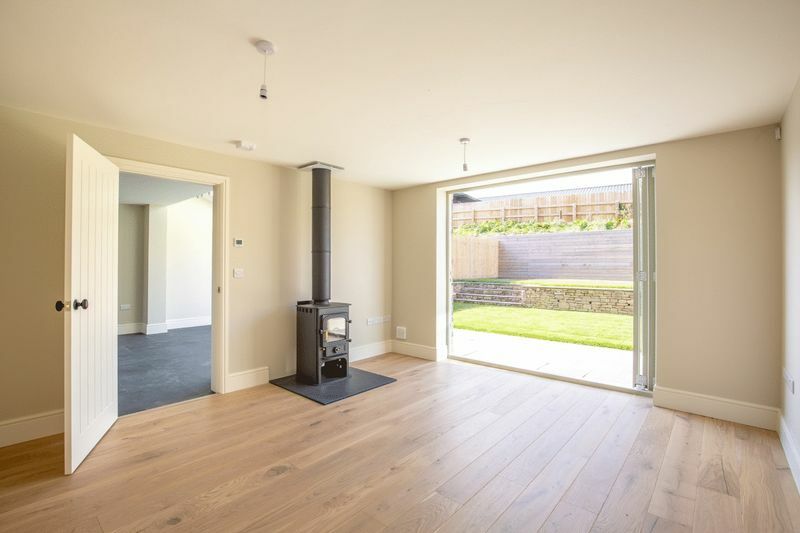 All the properties are sold on a freehold basis and are accessed directly from Hornbeam lane which is a private driveway bordered by recently planted Hornbeam trees. When all the houses are sold the freehold of the driveway and any communal land will be placed in a management company which will be passed to the owners of the houses. Mains water, electricity and drainage. CAT 6 data cabling throughout the property and wiring in place for security systems. The property has a Protec 10 year structural defects warranty, building control certificates from JHAI, all certification and warranties for air source heat pumps and solar MCS certificates. The Buyer register the appliances themselves. Mendip District Council. Telephone: 01749 343399. Somerset District Council. Telephone: 01823 355455. Energy Performance Certificates. Certificates are awaited and high gradings anticipated.